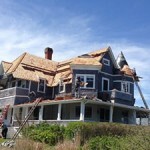 Associate Roofing is a professional Martha’s Vineyard Roofing Company. 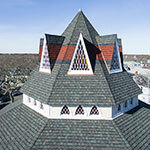 Vineyard Roofing is an experienced commercial and residential roofer on Martha’s Vineyard. Our professional roofing experience ensures that you will get the quality roof your commercial business or residential home requires to last through all of Martha’s Vineyard’s weather extremes. When it comes to choosing a Martha’s Vineyard roofing contractor, it’s important to choose one with the experience and knowledge to get the job done right and will stand behind their work for years to come. Mike Lynch is a third generation roofer and current owner of Associate Roofing. He stands by his grandfather’s tradition of honest hard work and commitment to quality craftsmanship to build roofs that will last. Associate Roofing on Martha’s Vineyard is a MA Licensed and Insured Roofer and General Contractor. Since 1932, Associate Roofing, Inc. of New England, has been serving the needs of commercial roofing and residential roofing clients. For over half a century Associate Roofing has exemplified the finest tradition of American family business – a roofing contractor who can always be counted on in terms of product knowledge, craftsmanship, efficiency and follow through. In addition, the Lynch family has believed in educating our customers on roof products and procedural options to ensure a satisfied customer and a job well done. Rest assured you are hiring one of the best roofing companies in the business. Associate Roofing staff are certified & trained an all aspects of your roofing project. Commercial roofing projects vary widely in size, scope and degree of difficulty.